Pyro Hands is indeed the most unlikely Architect you could ever imagine. However, If you were to ask him, he'd quickly say, "I was born to be an Architect, building is in my blood". Pyro Hands built beautiful bridges that connected cities to towns and made it possible for many to cross over troubled waters. For a short time, he was loved and considered to be an prolific artist and a genius builder. Unfortunately, Pyro Hands was unable to control himself and eventually he burned every bridge he ever built. This made his life, a very sad one. That was until he built the most beautiful bridge the world has known. Oh my God, I wish you could have seen it "The Kara Bridge", it was so beautiful, people from all around the world came to see it. 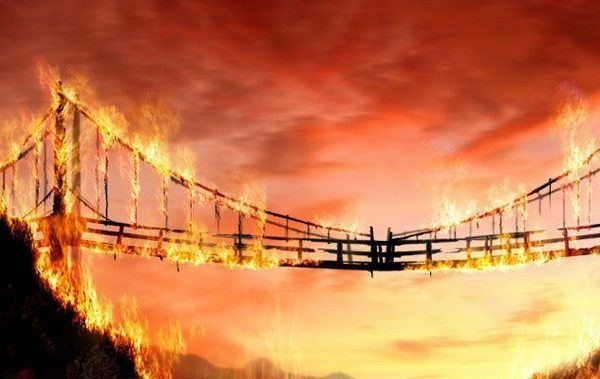 Pyro Hands should have been joyous, the "Kara Bridge" was his pride and joy, he should have been happy but he wasn't. Not only was Pyro Hands unhappy he was also scared, scared to death. He knew, beyond a shadow of a doubt, the "Kara Bridge" was the only bridge he could never live without. Unfortunately, Pyro Hands isn't the builder he claims to be, in fact, he destroyed everything he ever loved, he brunt every bridge he ever built. The Kara Bridge was no different, just like all the others, Pyro Hands brunt it to the ground as well. All of his bridges, connections, and the love he once was connected to, there all gone now, they lie in ashes beneath his feet.